Today we begin our coverage of the 2005-07 Preconstructed Deck Championships, and the crowd is bigger than ever! These games have become an Ertai’s Lament institution, and something we look forward to during the year. 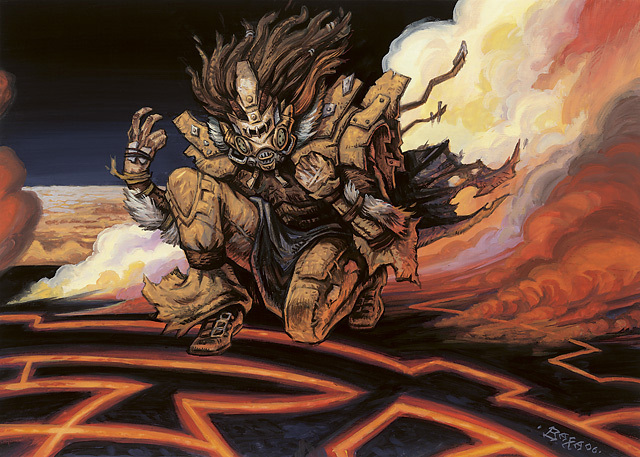 This season we’re looking at the precon decks from the 2005-07 sets: Ravnica block, Time Spiral Block, Coldsnap, and 9th Edition, and they’ll be making for some spectacular precon action! 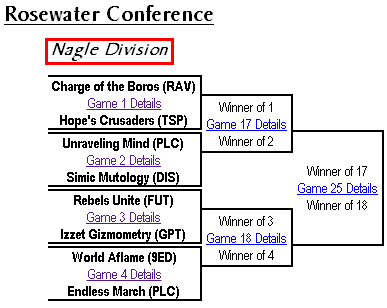 As is custom, we’ll be beginning with the Rosewater Conference’s Nagle Division. Given the absence of premium decks (Event Decks, Duel Decks, etc), it’s a wide-open field without any clear favourite, and the winner will be anyone’s guess! Every deck has a shot at eternal glory, and with a lineup of thirty-one decks, only one bye was needed to round out the field. There’s only one way to have your name written down in the Hall of Champions, and that’s over the backs of the other decks standing before you. Last season we instituted a giveaway and founded the Prediction League, and we’re delighted to see that interest this season has only increased. Luckily for our predictors, so has the prize pool- the winner with the most correct picks this season will walk away with either a full set of Dissension or Ninth Edition Theme Decks (plus a trio of Avacyn Restored boosters), or a pair of Avacyn Restored Intro Packs (and trio of boosters). With everything to play for and everything to win, let’s get the clashes underway! Outside of Coldsnap, every set in the Championship is represented in the Nagle this season, so we’ll be looking forward to a wide variety of matches. Let’s take a closer look at today’s contenders, in alphabetical order. And now... to the pit! Boros has a characteristically strong opener, leading with a Boros Recruit and Thundersong Trumpeter, trading early damage with a Knight of the Holy Nimbus. A Cavalry Master draws an immediate Lightning Helix from Boros, and before long so does the Knight. Boros then pounds away with a pair of Viashino Slashers, Screeching Griffin, and a Flame-Kin Zealot, with Hope clinging to life thanks to the efforts of a Thunder Totem. Hope then finds some stability behind a D’Avenant Healer and Errant Doomsayers, while it nabs a chunk of life off of a Divine Congregation. With some time dearly bought, Hope’s Crusaders fires back with a pair of Zhalfirin Commanders and a Gustcloak Cavalier. Boros threatens to break the stalemate when it finds a Sunforger and goes all in, unequipping it to grab a Dogpile. At 2 life and on death’s door, Hope fires back with everything it has…and delivers damage just shy of lethal. Then it flashes in a Celestial Crusader, pumping its side and stealing the win. Things go poorly here for the Boros, who falter out of the gate. They begin with a Boros Recruit and Viashino Slasher, while Hope’s Crusaders lead with a Knight of the Holy Nimbus followed by a D’Avenant Healer, Cavalry Master, and Gustcloak Cavalier. The flanking of the White Knights is Boros’s undoing as they can’t find a profitable block. They smash back in a gout of fury and fire after attacks are enabled by a Flame-Kin Zealot and a Rally the Righteous. At 6 life, though, Hope as all the fuel it needs to take the game. Unravelling Mind finds luck against it from the start, mulling down to six cards and not entirely impressed with its keep. Simic Mutology leads the way with a pair of Simic Initiates, swarming past Unraveling’s Undertaker, but gets two-for-one’d next turn when Unraveling finds a Kor Dirge and blocks with the Undertaker. Simic never quite recovers, and Unraveling blows past it with a Trespasser il-Vec, a madnessed Gorgon Recluse, and Mirri the Cursed. These are more than enough to overcome the feeble Simic defense of a Silkwing Scout and Starved Rusalka, and the Simic Basilisk comes down just a turn too late. It’s Simic’s turn to gamble with a questionable keep, and this time it doesn’t pay off. Unraveling Mind storms to a rapid victory when it leads with an Undertaker, drops a Trespasser il-Vec and madnesses out Brain Gorgers. Simic stalls on land and never musters an appreciable play, while the Trespasser’s shadow makes sure it gets in where it counts turn after turn until the Simic fall. The Rebels get off to a very solid start, leading with Amrou Seekers followed by a Defiant Vanguard. For their part, the Izzet immediately look to stall for time as it builds up its manabase, killing off the early Rebels with an Electrolyze that keeps coming back thanks to Izzet Chronarchs. Trains of Thought and Telling Time keep the Izzet’s hand full- and it needs it. The Rebels keep up the pressure, getting an Amrou Scout to stick and using it to crank out more Rebels: Knight of the Holy Nimbus, Riftmarked Knight, and even an Outrider en-Kor, while it neutralises Izzet’s Wee Dragonauts with a Bound in Silence. When the Rebels land a Zealot il-Vec (after an ill-fated attempt at a Putrid Cyclops), and follow with a Witch’s Mist, it sets up a lethal combo with the Zealot that kills off a Chronarch almost immediately. Next turn, the Rebels try it again.. and the result is a massacre. The Izzet respont by replicating a Pyromatics in response to the Mist, giving lethal to the Amrou Scout and the Zealot il-Vec, and a point of damage to the Riftmarked Knight…before Rerouting the Mist to finish off the Knight, too. With the Knight of the Holy Nimbus already taken care of off of a third Electrolyze, the Rebels see tumbleweeds blowing across their side of the table. The Izzet pull a Peel from Reality off of Nivix, Aerie of the Firemind, and use it to rescue the Wee Dragonauts and replay them. After a few probing beats from the remaining Izzet Chronarch and a Petrahydrox, the Izzet cast Train of Thought, replicate it five times, and swing for 13 with the Dragonauts for the win. The replay is a much faster game, with the Rebels having learned that to give the Izzet the luxury of time is to tempt fate. They begin using their Rebel creatures to summon more to the battlefield as fast as they can, with an Amrou Scout, Defiant Vanguard, Blade of the Sixth Pride, and a Knight of the Holy Nimbus all making quick appearances. The Blade gets traded for a Petrahydrox, but the Rebels’ beats go on. The Izzet, however, don’t do the same thing twice. Having played the long game, they go right for the short. A pair of Wee Dragonauts drop in rapic succession, and they carve into the Rebels for 10 off of a Repeal and Telling Time. The next turn, the Izzet play a Peel from Reality- and then counter their own spell with a Convolute! This puts the Dragonauts at 5/3, and they swing in for the kill as the Rebels watch helplessly from the battlefield below. World Aflame takes an early pounding from their opponent’s fast start, watching an Icatian Javelineers, Whitemane Lion, Aven Riftwatcher, and Children of Korlis all begin carving off chunks of its life total. A nightmare opening, it sees its life total go down to 6 just as March’s rises to 24. But then a funny thing happens to the land-light March. First World Aflame crushes the Lion with a Volcanic Hammer, then it sets about doing its grim task with brutal efficiency. It Demolishes March’s only Mountain, shutting off a colour. The next turn it smashes one of March’s two Plains. It drops a Dancing Scimitar to stabilise, followed by a Hill Giant. 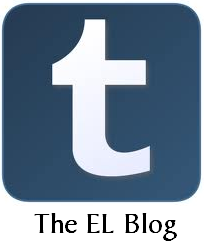 March drops another Mountain, so World Aflame uses an Anarchist to get back the Demolish. Down to only one land, March discards card after card, its hand bloated and swollen with cards it can no longer cast. World Aflame then starts sending Lava Axes to the face. it adds a Balduvian Barbarians, and the coup de grace is delivered through a Panic Attack– a brutal and commanding comeback. Karma catches up with “Big Red,” which happily sees two Mountains in its opening grip but then struggles to find more. Finding a third it manages to Stone Rain March’s Mountain, but it is quickly replaced. By the time World Aflame manages to land a Hill Giant, it is already being overrun by an Icatian Javelineers, Mogg War Marshal, a pair of Aven Riftwatchers (one of which it solves with a Volcanic Hammer) and- worst of all- a Calciderm. Gone shoves the Giant out of the way, and March closes out the game at 28 life. History repeats… but which history? Sadly for World Aflame, it is the last game and not the one previous. It keeps two lands and good cards in its opener, but again struggles to hit a third land drop. When it finally does find its footing, it is well too late. March hammers away with a Riftmarked Knight, the Javelineers, Mogg War Marshall, Goblin tokens, Errant Doomsayers, and Stormfront Riders. Small victories- like solving the Riders with a Volcanic Hammer or Stone Raining March’s only Mountain to prevent it from paying the echo on the War Marshall are the only victories it can take awash in the pungent smell of brimstone coupled with essense of what-might-have-been. With the first four matches decided, we have cut the field by half. Only four decks remain to content for the honour of representing the Nagle in the semifinals, and they’re off to tend to their wounds and mull over the day’s battles. We’ll be back next week to determine a Divisional winner! Until then, look for the next predictions thread in a few days’ time. See you then! 601.2. To cast a spell is to take it from the zone it’s in (usually the hand), put it on the stack, and pay its costs, so that it will eventually resolve and have its effect. 702.53a Replicate is a keyword that represents two abilities. The first is a static ability that functions while the spell is on the stack. The second is a triggered ability that functions while the spell is on the stack. “Replicate [cost]” means “As an additional cost to cast this spell, you may pay [cost] any number of times” and “When you cast this spell, if a replicate cost was paid for it, copy it for each time its replicate cost was paid. If the spell has any targets, you may choose new targets for any number of the copies.” Paying a spell’s replicate cost follows the rules for paying additional costs in rules 601.2b and 601.2e-g. So the copies from replicate spells shouldn’t have pumped the Dragonauts over +2+0. Apart from that, the Izzet deck played two great matches! I was sure the Rebel’s blade of the sixth pride would cut in half the blue/red guild, but it did an awesome job holding its ground. World Aflame did also a good job going to game three, knowing that core set’s decks are a bit underwhelming. And so ends a brief, beautiful glimpse back at the Golden Age of Land Destruction! Bitter irony indeed that so lean a deck as “World Aflame” missed its own land drops. Looking at 3 for 4 on my end. Interesting. I’ve got a bad feeling about this championship. Going from where I was familar with the sets back to those I’m not. Oh well. These are some great matches. Can’t wait for the next round! 3/4 for me, my mistake was World Aflame.